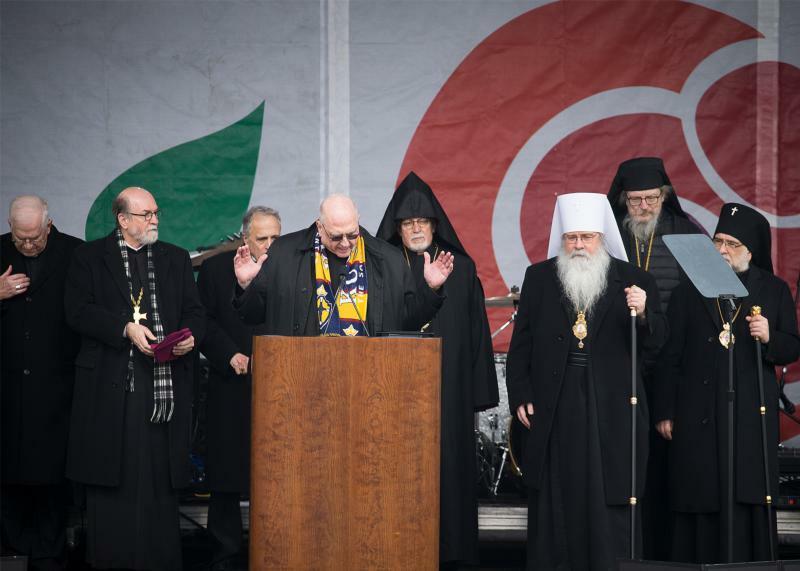 Archbishop Joseph F. Naumann of Kansas City, Kan., chairman of the U.S. Conference of Catholic Bishops Pro-Life Activities Committee, speaks Jan. 18 during the annual March for Life rally in Washington. (CNS photo/Tyler Orsburn) See MARCH-RALLY-CROWD Jan. 18, 2019. WASHINGTON (CNS) — Catholics “must do all we can to be God’s witnesses of merciful love in the world” and stand up for “the life and dignity of the human person wherever it is threatened or diminished,” said the chairman of the U.S. bishops’ Committee on Pro-Life Activities. “Protecting the life of the unborn children is the pre-eminent human rights issue of our time, not only because of the sheer magnitude of the numbers, but because abortion attacks the sanctuary of life, the family,” Archbishop Joseph F. Naumann of Kansas City, Kansas, said in a Jan. 18 statement. “Every abortion not only destroys the life of an innocent child, but it wounds and scars mothers and fathers … in reality, the welfare of parents and their child are always intimately linked,” he wrote. The archbishop also made it clear that pro-life Catholics “are concerned about the life and dignity of the human person wherever it is threatened or diminished,” and highlighted the sexual abuse crisis within the Catholic Church as an example of “grave injustice” to this dignity. Archbishop Naumann issued his statement ahead of the Jan. 22 anniversary of the U.S. Supreme Court’s decisions in the companion cases of Roe v. Wade and Doe v. Bolton that legalized abortion in all 50 states. The U.S. Catholic Church observes Jan. 22 as the National Day of Prayer for the Legal Protection of the Unborn Jan. 22. Jan. 22 also is the last day of the “9 Days for Life” novena sponsored by the Secretariat of Pro-Life Activities U.S. Conference of Catholic Bishops’ Secretariat of Pro-Life Activities. The full text of Archbishop Naumann’s message can be found here. Information about the “9 Days for Life novena here.